Synopsis: Eleanor is the new girl in town, and with her chaotic family life, her mismatched clothes and unruly red hair, she couldn't stick out more if she tried. Slowly, steadily, through late-night conversations and an ever-growing stack of mix tapes, Eleanor and Park fall for eachother. They fall in love the way you do the first time, when you are young, and you feel as if you have nothing and everything to lose. 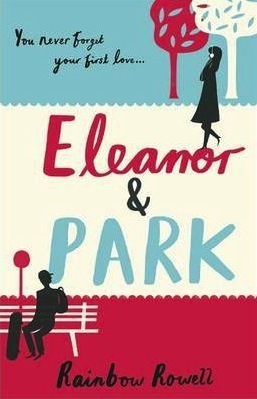 My Thoughts: Eleanor and Park isn't what I expected at all. I'm glad to say it was better than I initially thought it would be. I am slowly reading more and more contemporary and realistic fiction. I wouldn't say it's my favourite genre because I prefer post apocalyptic and paranormal books but I really enjoyed Eleanor and Park from beginning to end. There were no borings bits that I found tends to happen in some contemporary which was a bonus too! There are so many instances in the book where I can relate to both Eleanor and Park. The very first time that Eleanor shows up on the bus, I felt so bad for her. But I also love her attitude when faced with so many challenges. I would have probably cried a long time before she did and I think that is why I loved her so much. With her mismatched clothes and the way that she uses ribbons and ties, I was so glad that the Author made her the way she was and not some perfect stereotype of a girl that everyone tries to conform to be. I really felt for Park too. Especially towards the very end! His parents were so supportive of him, it was hard to imagine this sort of thing happening back in 1986, and his father knowing what he knew about the family. I think that's what makes his family all the more likeable. Especially his Mum. I guess this is a really good example of how first loves go. The awkwardness, and uncertainty when getting to know another person you happen to really like. By the end of the book I was wishing it didn't have to end! Favourite part of the book would have to be around 170, when I happened to be sitting there grinning like an idiot at work and thinking Nawwwwwwwwwwww this is awesome! Definitely not suitable for younger readers as it does explore their relationship a little more than other YA books. Fave Lines: Eleanor was right. She never looked nice. She looked like art, and art wasn't supposed to look nice; it was supposed to make you feel something.